Many Industries have seen technological changes that have advanced the connection with Customers but most changes still attract Customers by discounting the Selling Prices. Cloudfunding gives back control to the Business Operators by expanding the way products and services are sold to Customers - the full Selling Price value of any type of product or service is now able to be monetized via a global outsourcing process that uses an old trading concept with modern technology to validate payment. Instead of incumbents being central rent seekers taking advantage of Supply and Demand exchanges, there are new dynamics that utilize a democratic consensus from the global community to redefine how trade and commerce operates freely in the digital economy - a foundation for a democratic flow of economy to economy commerce and trade is formed with free flowing digital capital to stimulate localized productivity, from where sustainable global economic growth is achieved. Cloudfunding draws in the Global Crowd to Outsource the Selling of products and services in a global Supply and Demand marketplace using a free and neutral global trading unit of account - this trading unit is validated against the products and services that are tracked globally in a unique process that monetizes the Seller's full Selling Prices - the process perpetually generates Demand by incentivizing Buyers with Price Demand. The free global trading unit of account is a modern digital financial and economic version of an almost forgotten British concept that was proposed over 70 years ago at the 1944 Bretton Woods Conference - that proposal, although not accepted at the time, was based on having a global "unit of account used to track international flows of assets and liabilities", operating as a neutral trading value from a central mechanism. e2eCommerce and Trade doesn't just offer a platform for Sellers and Buyers to operate in traditional Buy and Sell commerce, it brings new dynamics to the mechanics of trading products or services for value by Outsourcing the Selling, a process that fully monetizes each item at the full Selling Prices - but then provides the platform for those items to be purchased separately by local Buyers with Price Demand, which opens up the marketplaces to an unlimited appetite for more products and services with a perpetual and sustainable Demand. Cloudfunding reverse engineers the online advertising model - instead of allocating a percentage of a product's value Cloudfunding increases the marketing value to 100% of a product's full value and through a transparent process validates the full product value as Free Digital Capital - this value is able to be collected and redirected back into global commerce as a free neutral global trading value, which anyone can collect and use as free working capital to help buy products directly from local sellers and still help to generate global productivity. This free digital global trading unit is 100% validated ( anchored ) against real productivity value in the selling of products and services on a global scale, and seamlessly jumps borders as free Direct Foreign Digital Capital Investment to stimulate supply and demand inside other economies, in free market trading environments, without causing any surplus or deficit ( assets and liabilities ), and as a consequence reduces private debt. 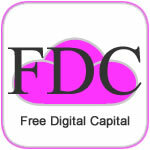 FDC - Free Digital Capital works by distributing working capital into the global crowd from where it uses economies of scale to monetize the full Selling Price of a Seller's inventory through a unique global wholesaler's bidding platform, which then releases the products and services back to the local markets at prices so low that it multiplies the buying power for local Buyers. 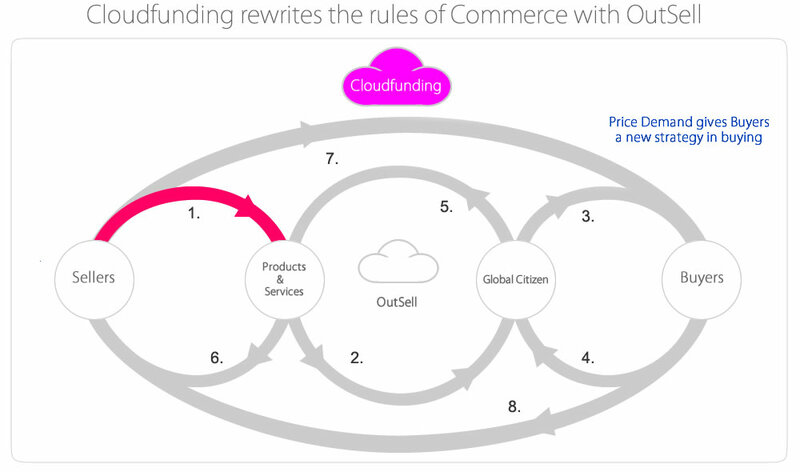 Cloudfunding is the paradigm shift in global commerce and trade, where financing and exchanging of global currencies in supply and demand is disrupted by the technical translation of the traditional commerce mechanics into a fractional economics and commerce environment, with a globally free direct digital exchange of values between buyers and sellers - constantly operating inside the commerce environment with the exchange of supply and demand, without the need to hold or transfer any national currencies across borders - effectively disrupting the banking status quo. The equilibrium of assets and liabilities through cross border trade is balanced further by the UBI Distribution Program that provides each User and Business any number of Universal Digital Income ( UDI ) Portfolios, in which the operator can collect and build any quantity of listed Location Symbols that represent locations of where productivity takes place around the world - through the continual real time processing of the OutSell and Commerce and Trade Productivity a Location Activity Tax ( LAT ) is collected and distributed equally across every global User's UDI Portfolio that holds the various quantities of Location Symbols. With all commerce activity on the Platform each product and service that's processed with the OutSell and Buying activity - it's linked back through to the Universal Digital Income ( UDI ) Portfolios from where all Users can build a collection of Location Symbols and gain a share of the Location Activity Tax collected and distributed across all the global activity in real time. With each Location Symbol recording only positive outcomes when productivity happens in a location's trading zone ( zero productivity has no negative result ) it comes down to each operator's strategy in holding the various quantities of Location Symbols to determine the borderless distribution of the LAT - the random selection and changing of strategies by portfolio operators who track and follow trends in productivity can determine the volumes in each Location Symbol being held, this provides the unbiased distribution and share that melts down into the various UDI Portfolio operators own local economy. The fact that the real time distribution of LAT into each economy is so randomly shared amongst economies as currency value equal to the local currency without any manipulation of currency trading or need to rely on inflation for growth brings rise to the way the new Digital Economy can change local economies. The Global Crowd provides the unique connection between sellers and buyers by being able to democratically influence commerce and trade on a global scale by being a Open Market Merchant - an OMM is a global virtual wholesaler that drives the OutSell process for any of the global sellers through the Direct Foreign Digital Capital Investment - DFDCI. 3. A process to Outsource the Selling takes place for each Deal at the full Selling Price, to virtual wholesalers - OMMs. 4. The sold Deals have the full Selling Price value locked in escrow waiting for the Deals to be released to Guest Buyers. There are no commissions or payment processing fees debited from the full Selling Prices - the funds held by the Accommodation Operators can be released anywhere in the world, even used to pay Suppliers or Staff. Any number of Rooms can be processed and stored ready to release at the most appropriate time to suit an Operator - although most accommodation is required by Guests in the few days prior and even in the last minutes, over the counter the Deals can fit any requirement - Deals are generally held for up to 30 days, with long term of 3, 6 and 12 months available. Any number of Rooms can be processed and stored ready to release at the most appropriate time to suit an Operator - Deals can be held for up to 30 days and even be released in the last seconds to un-deciding Guests. - winning purchase Price is debited from the Deals as they are released and purchased by the Guests - no fees or costs are involved. - the Price Demand generate the real time demand. Travelers who have been in contact with Accommodation Operators can be on the listed Buyers - QwickAlerts notify when Deals are released. Cloudfunding Accommodation gives back control to the Operators by expanding the way services are sold to Customers - the supply of a service like Accommodation has a certain time limit to take advantage of. Cloudfunding draws in the Global Crowd by Outsourcing the Selling of the seller's inventory on a global scale to a Supply and Demand market using a free and neutral global trading unit of account - this trading unit is validated against global products and services and tracked in a unique process that monetizes the seller's full Selling Prices - this process provides the incentivize for Buyers to compete for the Price Demand, perpetually generating demand. - the Queen Bee Project is a unique Loyalty and Customer Acquisition Program with a long tail benefit for businesses and their customers, even spreading to other business customers as the interconnection spreads across all the commercial activity the customers engage in. The QwickPic Platform is built as a complete economy, it uses a Global Crowd consensus to Outsource the Selling and algorithmic economics to disrupt the traditional role where the Sellers are always expected to discount and lose in Supply and Demand - Cloudfunding alters the dynamics between Supply and Demand.